Good news to APU Accounting & Finance Students and Graduates! 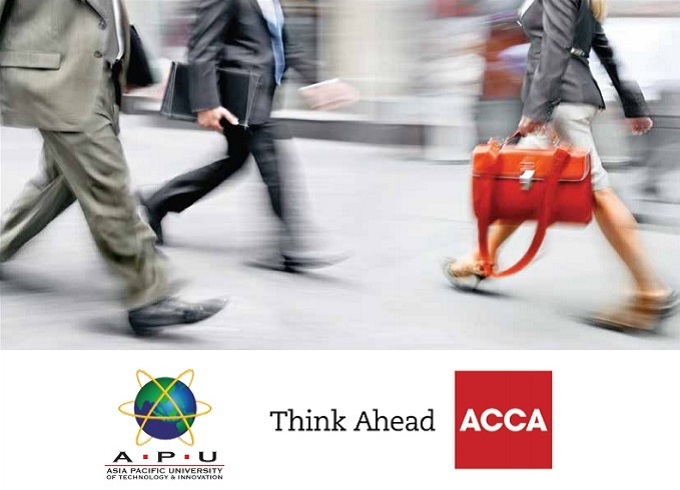 APU is one of the few selected universitities to join the ACCA Accelerate Scheme. This special arrangement between ACCA and APU gives an opportunity for students to register early with ACCA and accelerate their career in accounting and finance. You can now complete your ACCA Professional Papers (P1 – P7) while you are studying in your degree programme or even if you have graduated. Classes will be conducted during weekends at APU, to provide the convenience to study in APU’s conducive learning environment. We will offer all the optional papers. All the above papers are targetting to prepare students for September 2018 ACCA examinations. The Normal Course fee is RM 1200 per paper. Tuition Fees are inclusive of study materials. As an APU student/alumni, you are eligible for 10% subsidy from the course fee. The new Ethics and Professional Skills module is designed to increase your employability by exposing you to realistic business situations and developing the full spectrum of advanced ethical and professional skills. To take maximum advantage of the support provided by the module, we recommend you complete it before attempting any Professional level exams. We may also run classes for F1 to F9 papers, provided there are 10 students minimum joining. Subscription Fees waived for a period of two (2) years from the date of their registration.